You are here: Home / American Idol / Dear Adam Lambert: Why your fans insist on celebrating every May 8th as Adam Lambert Day! We’ve heard you say Adam Lambert Day was only an actual day on May 8, 2009 and that it’s not supposed to be recognized every year. In fact, Lila and I were there when you said that at the May 5, 2015 San Diego Secret Happy Hour Meet ‘n Greet at Bali Hai. Why, you may ask, do we continue to revel on May 8 as one of our favorite holidays? When you think about it, it makes total sense. We celebrate something called a BIRTHDAY every year even though it’s really the year anniversary of our birth. Well my dear, the same goes for Adam Lambert Day! We’re celebrating you – the joy you, your music and your performances bring us. Just the mention that you’ll be in front of us again, whether it’s on television, movies, a YouTube interview, or a radio show performance brings such light to our lives. For the last seven years, I’ve had the complete honor to write for “Official/Unofficial” adam-lambert.org, the original Adam Lambert fansite. I’m using that privilege now and taking the liberty to speak for Glamberts as a Whole. Being based in your hometown of San Diego has given Lila and me some extra advantages, like being present at Mt. Carmel High School for your American Idol Homecoming, where we watched Mayor Jerry Sanders proclaim May 8th as Adam Lambert Day! (6:03 in the video below). Edit: this video was just posted from Reni O from the closing show in Munich yesterday and Adam talks so lovingly about the Glambert friendships and he knows how he’s fostered them, around 2:45! So fans, how will you be celebrating Adam Lambert Day? Since we met at the San Diego Idol Homecoming, Lila and I will be celebrating the anniversary of our friendhip as well as Adam Lambert Day 24 hours later, by going up to LA for a concert featuring Tyler Glenn, Mike Posner, The Karma Killers and others. We’re going mostly to support Tyler, who Lila and I have spent personal time with on a few occasions. Tyler, a lifelong Mormon is the lead singer of Neon Trees. He came out publicly over 2 years ago but most recently he’s come out against the Mormon Church, denouncing his faith for their policies towards LGBT with his new solo single, Trash. A retrospective of the day at Mt. Carmel High School – including the streaker! So grateful for Adam and the friendships he’s “facilitated” since that first day on American Idol over 7 years ago! Including the fans I’ve become fast friends with after first “meeting” them here on this very site, my first “go-to” Adam Lambert fan site back in the early days of getting to know Adam..
No specific plans for celebrating “Adam Lambert Day”, but in reality, every day is Adam Lambert Day for me in some way or another! By the way, it’s *probably* not happening for Adam to fly home to LA before the EU Queen + Adam Lambert round of festivals/performances starts later in May.. He has a solo performance in London at G. A. Y. nightclub on May 14th, so seems like he’ll be taking a little R&R, in London perhaps (or elsewhere in Europe), before he starts rehearsals and then performances with the men of Queen.. Just guessing but seems like that might be the case.. So no LA for him until the end of June perhaps… Guess we’ll see..
Oh thanks sweetie! I remember I did see something about G.A.Y. recently. That gorgeous house of his – hopefully after Queen he’ll get to spend a lot of time there. But I’m really hoping for another USA round of Queen + Adam Lambert! Yes we need another round of him with Queen……this time Ill go to more than two shows. Me too Carol!!! Fingers crossed………. I so agree Carol….and I will be celebrating his day. I love this guy and he deserves a special day. Ah, that video took me right back, so fun, thank you. Completely agree! You took the words right out of my mouth. We Glamberts are a loyal group. I can’t get enough information about my man. Thanks so much to you both. Although I don’t comment often here, I do read all of your posts and watch the videos. You have brought me so much happiness I can’t even begin to thank you enough. My dream would be to get Adam to perform at my Pride festival. Here where I live, until last year we had no local Pride celebration. Since I am the proud mom of a gay son, I thought it was time to bring a celebration to my area so that my son and others in our community could celebrate one day together. It has turned in to a large festival with the first year bringing over 3,500 people on a day where it rained! Having Adam play at this event is just one of my dreams along with meeting him. Watching him live proud was a bit of inspiration for me to create our Pride festival. I also wanted my son to have a place to celebrate who he is where her won’t be judged. Anyway, sorry to go on here, but my admiration for Adam is not only as the outstanding performer but also as the beautiful human that he is. Thanks so much to you both for sharing these stories and your moments with me. I’d also love to meet you ladies! It was a great time to be living in San Diego during Adams American Idol journey. So fun to see him ride in the red car around the track. I was shocked there were not more people there. I also saw him and his costume for AI be inducted into the Hard Rock Hall of fame. I saw many concerts in Ca, Az and CO. Living in Florida now I don’t have the access to him I once had so I am really glad of the time I had back then. Awesome community of fans!!! I just have to be happy with when I see Adam on my computer. I doubt if I ever get to see him in person. But I love everything about him! He has such a special singing voice. I have lots of his songs n my Ipad. He only gets better as time passes.Still love you Adam Lambert! Carol, thank you so much for this particular post and all you passionate blogging on Adam! I am with your blog since 2009. That time, Russia knew nothing about him. Your site was a wonderful “open window” which allowed to get the reliable info on this incredibly talented person. Then my daughter joined me in my passion for Adam. This led our steps to London, the first Queen + AL show, in the Hammersmith Appolo, in July 2012. And now I find myself a bit older (my daughter insist on “elder” ;o)) ), a bit wiser (do hope so) – but still the same enthusiastic about Adam as I was…almost 7 years ago (Oh, my!). We had a quiet day, today. Full of relaxation and meditations. It’s a beautiful pink sunset here, in Saint Petersburg, Russian Federation. We wish you, your close people and Adam the Strength and Harmony. I’m so happy you’ve kept this site going. Happy AdamLambert.Org Day to you. I really would LOVE for Adam and Tommy to do another GLAM NATION TOURS!!! Adam needs to remember his fans.As a 61 yr old fan I believe Adam should do Glam Tours every 5 yrs or so.As one who has never had the pleasure of going to a concert (yet) I’d love my first one to be a glam one.just saying! !Adam woke music up in me and for that I’ll always be thankful. What a fun day to remember! Thank heavens to Adam Lambert for spicing up our lives! thanks! 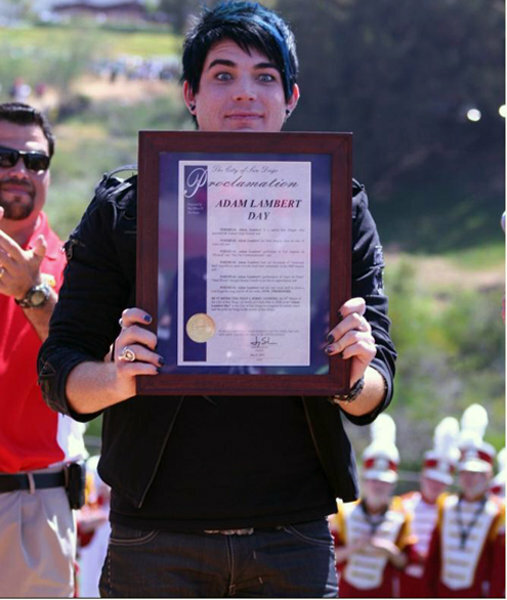 Happy Adam Lambert day!